Ask fellow campers about "Camp'N RV" and nearby attractions. Wow, We were able to park our 24 foot in a lot and still stay connected to the truck. Place is just off the highway, really really clean shower block. Great place for us to pull off for the night. We just stayed overnight. We camped at Camp'N RV in a Travel Trailer. Shopping within 5 min of camp. 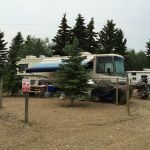 The park is very easy to find being right off of the Yellowhead Highway just west of Lloydminster. There is a short dirt road to get to the park, but it's a great location. We were afraid that there may be some freeway noise, but that was not the case at all. The park is very open and easy to negotiate to your RV to your spot. We had a large pull-through spot that was very wide open and level. The utilities worked well. We were impressed with the cleanliness of the park; it's evident that the owners take pride in their park. We camped at Camp'N RV in a Fifth Wheel. I wasn't impressed with the washroom, shower and laundry facility. With 47 camp sites on this property, 3 shower stalls and two toilets for the men and one shower stall and toilet for the ladies is grossly inadequate. There's a liability waver to sign regarding the stinky well water and possible adverse health affects it may cause. 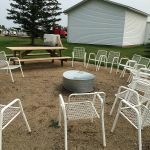 As well, there's only 2 community Fire pits and they're not permitted on individual campsite locations. There's only 1 wifi router to service 47 campsites and its also inadequate. How can they advertise wifi when you can't get a clear signal to even check your Facebook. We camped at Camp'N RV in a Travel Trailer. Thank you for your review, we appreciate your feedback, we do all we can to meet our client expectations. Occupants have a choice to use our shower facilities instead of individual camping units and as such there may be a wait time. Water - The campground and our residence water comes from the same well. We insure that all our clients are aware that our water comes from a well on the property and that it is an untreated supply, our installation is approved and regularly tested by Alberta Health and test reports are posted in the shower house information board. Wood burning fire pits are not allowed at each individual site due to fire risks and the proximity of other campers. Wifi - internet is limited to 3Mpbs by our supplier which is Telus. 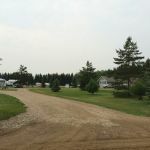 Our office and residence is on the same line as the campground and is affected by slow speeds equally when there are many users at one time. Unfortunately an internet line is limited in the amount of traffic it can handle at one time. Great stay, camping in winter is tough but these guy`s are set up to make it work. Good highway access with wide roads, no problem with large units. Sites are all back in. Some sites are close to a spruce tree line which offers great protection from the wind. Well kept facilities especially the shower/laundry area, very neat. This facility only looks to be a couple years old so in good condition throughout. Pick the sites along the tree line for winter, 5, 7-12 are good sites We camped at Camp'N RV in a Fifth Wheel. Stayed several times at this site, always good. Campground is easy to find with google maps, and there is a highway directional sign near the turn off. The sites' water is available in the winter inside heated boxes at each site, and power and sewer place for good access. The road off the highway is gravel but is only .25 km to the park entrance. Each time I have been here the roads were plowed, no potholes to speak of. The shower house is likely one of the best I have seen. The owners keep it very clean and I would compare it similar to a hotel washroom in decor. There is 3 showers so there has not been any issues for waiting to use. Overall a nice place just a couple minutes from the edge of the city. 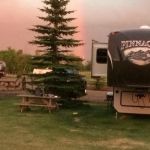 We camped at Camp'N RV in a Fifth Wheel. All shopping that I needed was on the West end of the city just a couple minutes from the rv park. Stayed October 2014 to Feb 2015, nice to find a place that can accommodate winter camping with full services. Really clean washrooms. Operators only there evenings and weekends. Quite able to sleep during the day. We camped at Camp'N RV in a Fifth Wheel. Lloydminster is only minutes away, taxi and pizza deliver to site. Are you affiliated with Camp'N RV ?